Guard short dribble to a side. Forward on the ball side goes to the low post. On the other side forward cuts low and goes up using the staggered screen of 5 and 4. Forward receives the ball from 1. 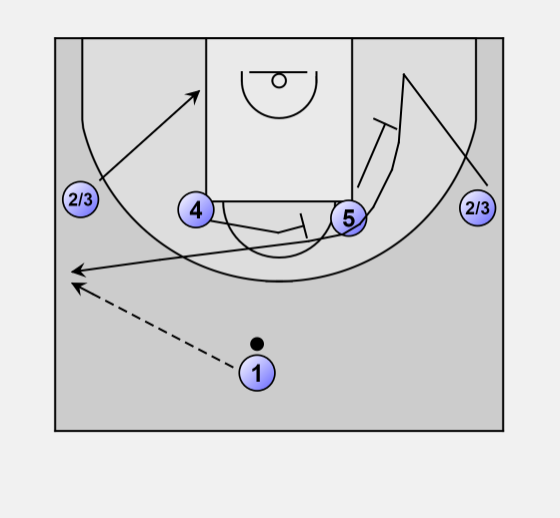 Base screen between the low post forward and 5. After the screen the forward moves to the corner. 1 and 4 also clear the area. If the ball doesn't go to the post player 5, swing the ball quickly from 3 to 1 to 4 to 2 looking for a 3 point shot.